Look out, Dell XPS 13. You're not the only Linux laptop in town. For most people running Linux on a laptop, chances are they had to go through the ritual of wiping Windows and installing the Linux OS. It’s a time-honored tradition in the Linux world, but things are slowly changing, with Linux now coming preinstalled on some very nice portables. Case in point: the ultralight System76 Galago Pro, a laptop that pleasantly surprised me more than once. Traditionally, getting your laptop to work with Linux can be a pain. Old ThinkPads are still a favorite among Linux users for their reliability and compatibility with the Linux kernel. And though modern kernels have come a long way in hardware compatibility, just grabbing a laptop and hoping for the best can still be a big gamble. Right now, Dell is the biggest brand to create laptops specifically for Linux. I’ve played with three of its models, and they’ve all been a joy. But Linux is, obviously, a niche segment of Dell's laptop business. Not so with System76, which is more of a boutique company whose business is built on Linux compatibility. 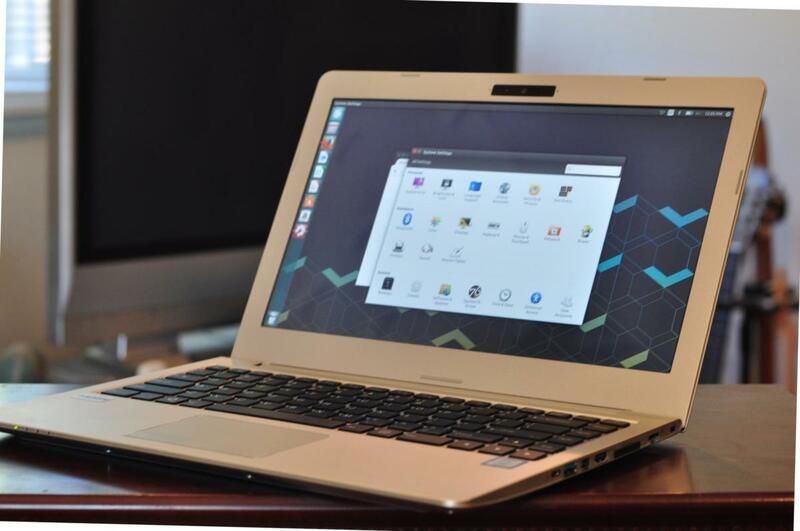 Just as boutique PC builders like Maingear and Falcon Northwest cater to gamers and enthusiasts in the desktop market, System76 is doing much the same for the Linux laptop market. The Galago Pro is aimed squarely at machines like high-end Chromebooks and laptops like Dell’s XPS 13 Developer Edition. 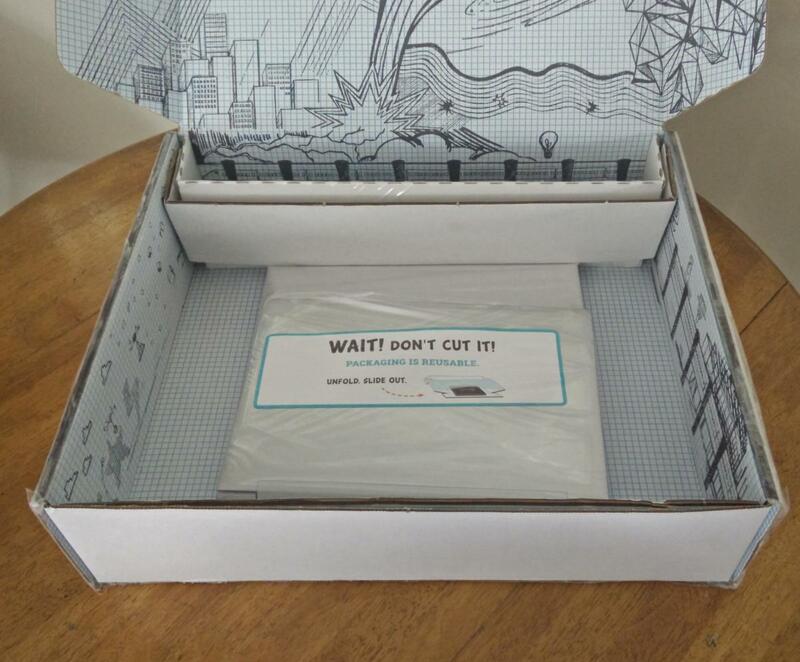 System76's unique approach is evident right from the product packaging. On the outside, the cardboard box the Galago Pro came in looked like one you might get from Dell, Lenovo, or anyone else, but inside, the packaging was quite different. Gone were the bulky foam blocks (of dubious recyclability) and excessive cardboard forms. Instead, the laptop was held in place by a thin film of plastic attached to the ends of a piece of cardboard. The minimalist packaging for the Galago Pro will make recycling the box way easier. The ends of the cardboard were folded behind the laptop, creating pressure that held the laptop in place. It’s rare to see sustainability addressed in the tech product packaging, so this was happy surprise number one. Happy surprise number two happened when I picked up the Galago Pro for the first time. This thing seems lighter than its size suggests. I could feel the cool touch of its aluminum body, yet part of my brain wondered whether the laptop was some cheap plastic thing or possibly missing parts. The 2017 System76 Galago Pro. As light as it is, the Galago Pro is actually heavier than its class rival, Dell's XPS 13, weighing 2.87 pounds to the XPS 13's 2.7 pounds. But the Galago Pro is also 1 inch wider than the XPS 13, with total dimensions of 12.97 x 8.85 x 0.55 inches. So the greater density (mass divided by volume) of the XPS 13 (with touch display) means that while the XPS 13 is lighter, it actually feels “heavier” for its size than the Galago Pro does. The Galago Pro’s weight is also surprising given its specs. The model I tested came with an Intel Core i7-7500U dual-core (with Hyperthreading), 8GB of RAM, and a 250GB Samsung SSD. 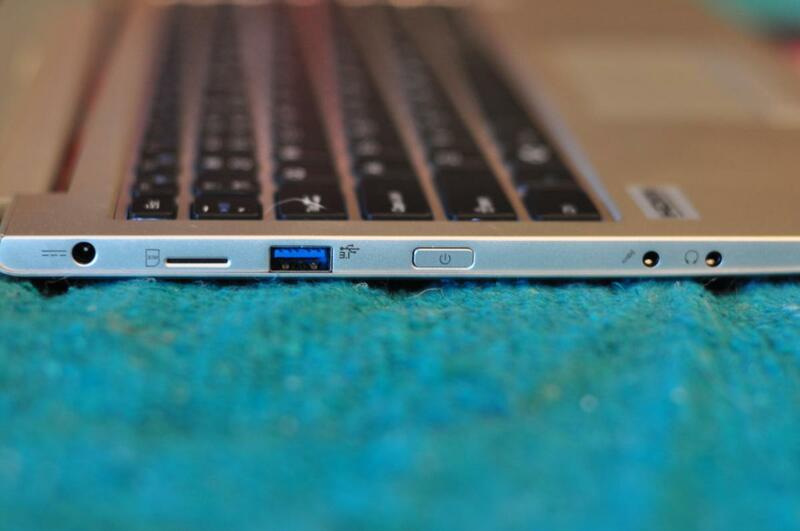 The left side of the Galago Pro has a USB 3.1 Type-A port as well as the audio jacks, power button, and a slot for SIM cards. It sports a litany of ports for connectivity: two USB 3.1 ports, a USB 3.1 Type-C (with Thunderbolt) port, a Mini DisplayPort, an HDMI port, a Kensington lock, an SD/MMC card slot, and separate 3.5mm jacks for headphones and a microphone. Surprise number three came when I noticed that the Galago Pro also comes with a slot for a SIM card, and a expandable, low-profile RJ-45 ethernet port. Such bounty! 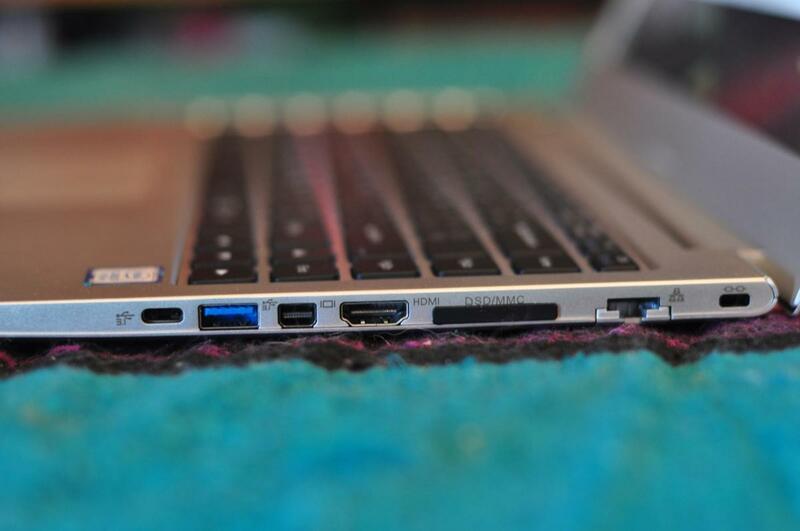 The right side of the Galago Pro has two USB 3.1 ports (one Type-A and one Type-C). It also has two video output ports (one MiniDP, one HDMI), a expandable RJ-045 ethernet jack, an SD card slot, and a Kensington lock. Sporting an Intel Wireless-AC card with Bluetooth, you can use most Bluetooth mice, keyboards, and headsets without a problem. The RJ-45 port—one of the best things about the Galago Pro, in my opinion—means you can use a handy-dandy ethernet cable to download software updates in a jiffy. Business travelers may also note that many hotel rooms still have a bright blue Ethernet cable sitting at the room’s desk, which will often offer better connectivity than sometimes-spotty hotel Wi-Fi. The hardware specs of the 2015 Dell XPS 13 used in our benchmark compared to the 2017 System76 Galago Pro. That ethernet jack is also a great fallback for users who might get themselves into trouble when installing another Linux distro or if an update goes awry. 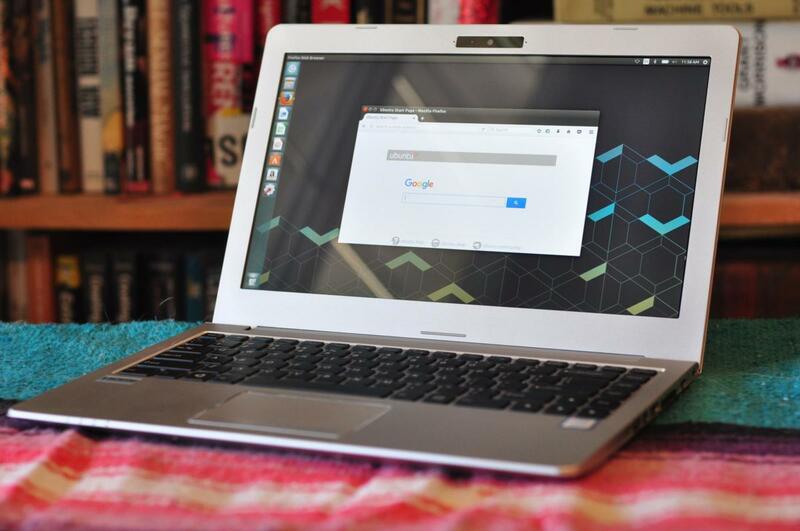 Although the Galago Pro’s Wi-Fi worked just fine, if Wi-Fi goes on the fritz in Linux, it can be a huge headache if you don’t have any other way to get online. The Galago Pro's palm area is pleasantly devoid of OS or parts decals. 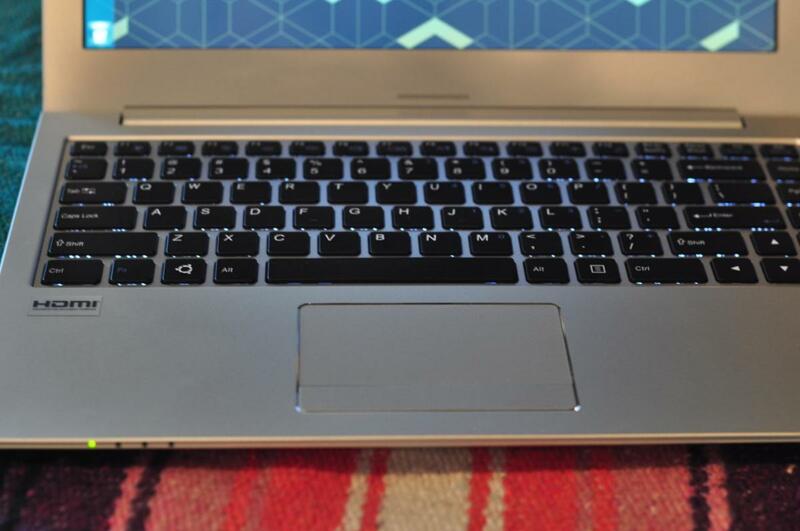 Former MacBook users might find the Galago Pro’s keyboard familiar—black Chiclet keys surrounded by smooth aluminum. A pretty significant bezel surrounds the Galago Pro's screen (the XPS 13’s is very slim by comparison), but the 13.3-inch, 3200x1000 pixel display has about the same pixel density as the XPS 13, so display-wise the two are on par. The Galago Pro ships with either Ubuntu 16.04 LTS or Ubuntu 17.04. The 17.04 edition features Linux kernel version 4.10, which has improvements for Kaby Lake CPUs and increased compatibility for certain Wi-Fi hardware from Intel. That said, the Ubuntu installation comes with a System76 PPA repository added to the software sources for device-specific drivers. (Dell also includes a vendor-provided PPA for hardware.) The PPA allows for driver backports for users of Ubuntu 16.04, which ships with the much older kernel 4.4. 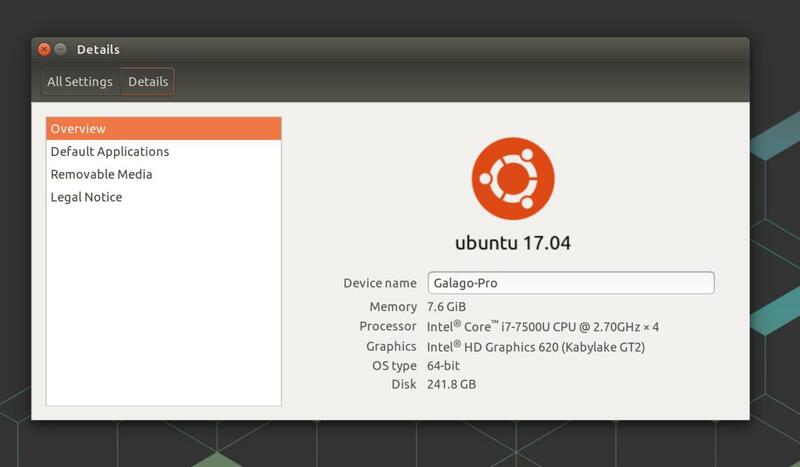 The Galago Pro's system information screen in Ubuntu 17.04. The experience on the desktop is almost identical to what you’d get with any other Ubuntu 17.04 installation. While the OS comes with LibreOffice and Firefox for office and web work right out of the box, I recommend running an update by opening up Terminal and typing sudo apt update and sudo apt upgrade as soon as you hit the desktop to get the latest software versions and security patches. When it came to testing the Galago Pro, I had a lot of trouble using the Phoronix Test Suite (PTS) that I usually use to evaluate laptops. Several of the tests would fail to install or install incorrectly. After trying different versions of PTS as well as different versions of the individual tests, I identified the culprit: Ubuntu 17.04 ships with a newer version of the GnNU C Compiler, known as GCC. For most people, a newer version of GCC is a good thing, but the newer version managed to break the older software that is used in the tests. If you're looking to reproduce these tests, you’ll need to install gcc-4.8 and point to the symbolic link /usr/bin/gcc to /usr/bin/gcc-4.8 (or similar). 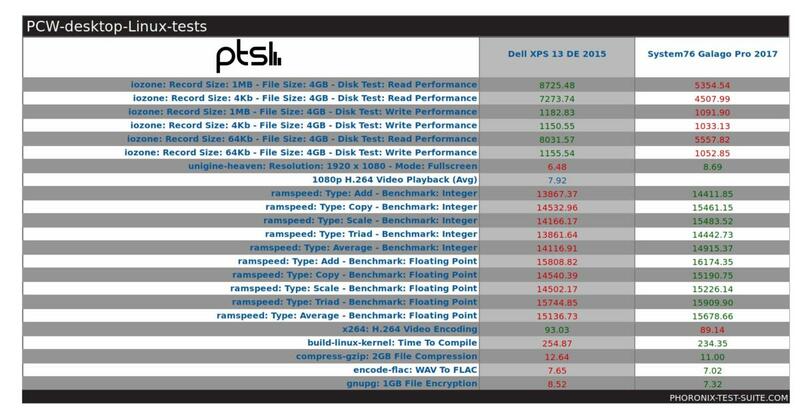 The Galago Pro beat nearly every benchmark set by the 2015 XPS 13 Developer Edition. There were two notable shortfalls: the IOZone test (disk performance) and x264 video encoding. In another test, the H.264 decoding run failed because of a software error, so I’m not going to count that against the Galago Pro. However, given the performance of the 2016 XPS 13, which also sports a Kaby Lake Core i7 CPU, along with the results of the other tests, it's safe to assume that the Galago Pro's CPU usage for H.264 decoding would have fallen below the 2015 XPS 13’s marks. In terms of CPU tests that did run, the Galago Pro did quite well. However, there is one caveat to note: The 2015 XPS 13 I tested had 16GB of RAM compared to the Galago’s 8GB. Having twice the RAM can make a big difference in some of these tests. That said, the RAM in the Galago Pro is more modern, and beat out the XPS 13 in every RAMspeed test run. 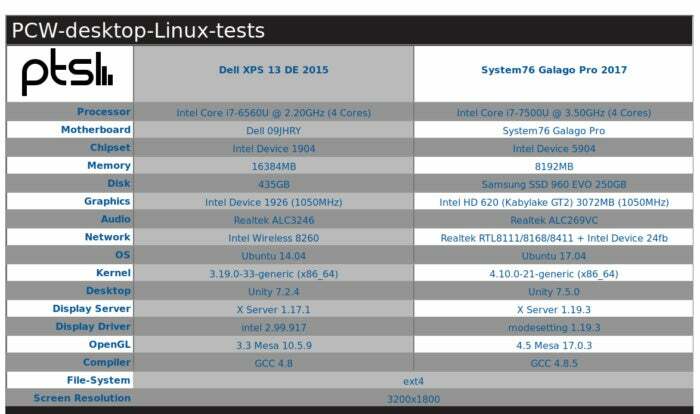 The Linux kernel compilation test took 234 seconds versus the 255 seconds for the 2015 XPS 13. That’s an 8 percent improvement over the 2015 XPS 13. Compression of a 2GB file using Gzip took 11.0 seconds on the Galago Pro, a 13 percent improvement over the old XPS's 12.6 seconds. Encoding a WAV file to FLAC took 7.02 seconds on the Galago Pro, while the XPS did the same task in 7.65 seconds. That 0.63-second difference, while small, is an 8.24 percent improvement in performance. Encrypting a 1GB file with GnuPG (GPG) took 7.32 seconds compared with the XPS 13’s 8.52 seconds, resulting in a 14.1 percent increase in performance. In the x264 test, the Galago Pro lagged behind the 2015 XPS 13, encoding at 89.1 frames per second compared to the XPS 13’s 93fps. That’s a 4.18 percent drop in performance. While the Galago Pro's i7-7500U is faster than the XPS 13’s i7-6560U, the x264 test loves cores and memory, which gives the XPS 13 the edge. In the Unigine Heaven graphics test, the Galago Pro was about on par with the newer 2016 XPS 13. Like both XPS 13 models, the Galago Pro is not a gaming machine. There's enough power to run simple 3D games. But you can forget about playing Rocket League on this thing. In my battery-rundown test, the Galago Pro managed to survive about 3 hours, 58 minutes when disconnected from the wall. That’s not an all-day lifespan by any means, but it's enough for short jaunts to meetings or a writing session in a coffee shop. It’s a good bit shy of the XPS 13’s lifespan of over 6 hours. When questioned about it, System76 said it's working on software to extend battery life and optimize the laptop as much as possible. Although Dell seems to dominate Linux laptop offerings with the weight of its brand, smaller system builders like System76 are out there making great machines. Is the Galago Pro perfect? No. But it is pretty handsome, and it has a lot of connectivity for those who really need it. (That ethernet port is a big plus for people who do a lot of work on the road and don't like relying on Wi-Fi, or having to use dongles). That said, the XPS 13 does make a persuasive counter-argument with its touchscreen and longer battery life. That brings us to price. As configured, the Galago Pro I tested costs about $1,252. A similarly configured XPS 13 (with QHD touchscreen) runs about $1,650. You can do a lot with that $400 savings, if battery life and a touchscreen don't outweigh connectivity options. Though I don't recommend using a PC with less than 8GB of RAM nowadays, you can get a Galago Pro with an i7-7200U, 5GB of RAM, and a 120GB SSD for $950. That’s $100 more than Dell’s bare-bones XPS 13 Developer Edition, but the base Galago offers a QHD screen, whereas the base XPS 13 limits you to a 1080p HD screen. Taking all of this into consideration, the Galago Pro is a worthy competitor to the XPS 13 in both capability and price. The Galago Pro offers utility to Linux users who need it, while the XPS offers sleek business styling and a bigger battery.